Pokhara is one of the best places to visit in the world. 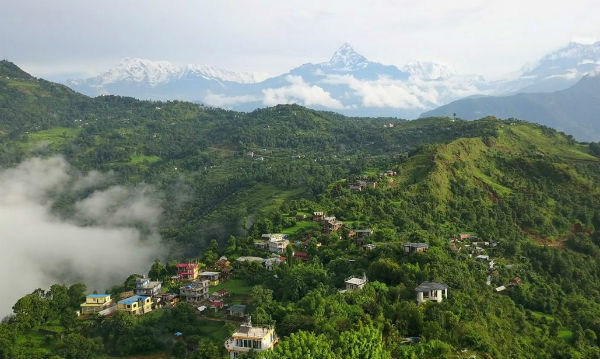 You won’t find any other place as beautiful as Pokhara in its richness in scenic beauties and heart pleasing sceneries and views of Lakes and Himalayas, which makes it a worth to visit a place at least once in a lifetime. 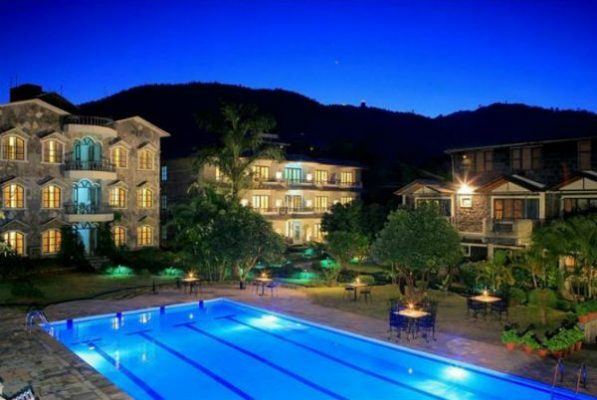 Every year many tourists visit Pokhara from around the globe and for the best accommodation and comfortable stay for them, here we have listed the list of best luxury hotels in Pokhara. The Hotel Pokhara Grande is a Five Star hotel in Pokhara which is just 1.2 km away from Pokhara Airport. Hotel Pokhara Grande has situated away from the noise and bustle and yet in an easy walk to the sights and lakesides. It is one of the best hotels in Pokhara and offers a luxurious and comfortable stay. The Hotel Pokhara Grande offers the rooms and suites which are well equipped and with free Wi-Fi and cable TV. Rooms are well equipped with a minibar, tea/coffee maker, well-furnished floors and large windows to view the scenes of the Himalayas. 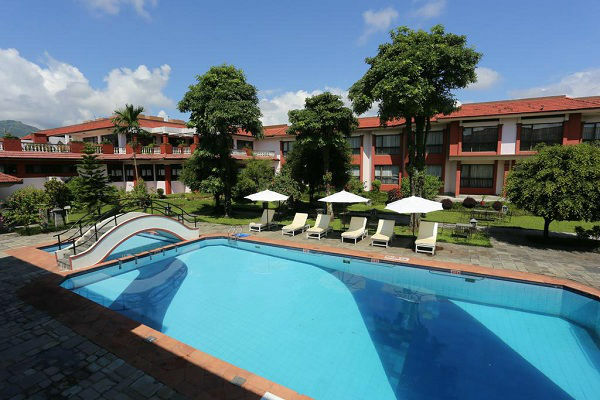 Hotel Pokhara Grande also offers swimming pools, spa, massage service, kid’s pool, outdoor pool, fitness room, banquet or meeting facilities and business center. A La Carte Restaurant and Thasang Restaurant offer various dishes and foods. Thasang Restaurant offers Tibetan food which is open for lunch and dinner. Trishna Lobby Bar offers different drinks and cocktail and also can get light snacks and drinks at the poolside in Hotel Pokhara Grande. It also offers free private parking, 24-hour front desk service, babysitting/child services, daily maid service, shuttle services, safety deposit box, gift shop, shops, tour desk, ticket service, designated smoking areas, beauty shops, non-smoking rooms and laundry service. And also provides the services of a sauna, spa, hot tub or jacuzzi bath, steam room and spa lounge. 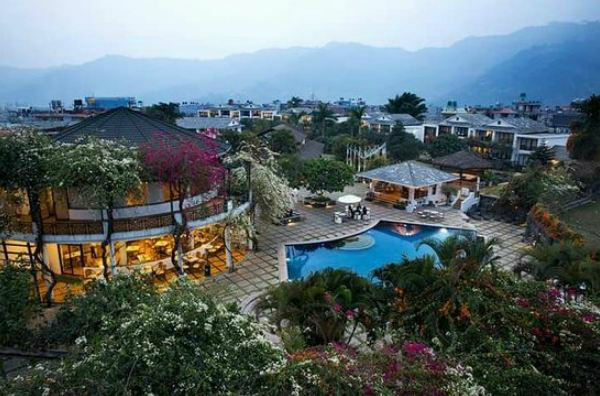 The Pavilions Himalayas offers the five Star accommodation and luxurious stay. It is located 3.5 Km from World Peace Pagoda and 6 km from Pokhara Airport. The hotel is located in the natural paradise of a lush environment with majestic views of mountain range. All rooms are well equipped with flat-screen TV with satellite channels, a private bathroom, wardrobe, and desk. Selected rooms are also featured with fridge and kitchenette. Free Wifi is available in all areas of the property. The Pavilions Himalayas serves a continental breakfast every morning. Guest can also have different local and international dishes and cuisines in the in-house restaurant. The restaurant also serves a special diet menu on request. And for drinks and entertainment bar is also available on the property. The hotel also features the outdoor pool, sauna, spa, swimming pool, massage, fitness, and wellness centers. Hiking is also popular in the Pavilions Himalayas as a recreational activity. They also offer non-smoking rooms, designated smoking areas, free private parking, safety deposit box, air conditioning, heating, shuttle services, daily maid service, laundry and dry cleaning. Tiger Mountain Pokhara Lodge is located in Lekhnath, Pokhara which is at 7 Km from International Mountain Museum. Rooms are well equipped with a desk, seating area, bathroom and free Wi-Fi. Private parking is also available on the property but pre-reservation is needed. For delicious food and cuisines, Tiger Mountain Pokhara Lodge has a restaurant and also offer kid’s meal, chocolate, cookies, fruit on request. A bar is also available on the property for different beverages and other drinks. Wine and champagne are also available in the bar. Off-site recreational activities; Golf course, hiking, canoeing, fishing, cycling, bike tours are offered by the Tiger Mountain Pokhara Lodge. They also offer board games or chess, spa and head and full body massage facilities. The Tiger Mountain Pokhara Lodge offers shuttle service, designated smoking area, wake-up service, non-smoking room and VIP room facilities. Swimming pool and an outdoor pool is also facilitated by the lodge. They also provide car rental, newspaper, family rooms, safe, daily housekeeping and laundry service. Rupakot Resort is situated in Rupakot, Kaski district which is just an hour drive from Pokhara Lakeside and Airport. The views and sceneries that the resort offers are worth to visit. Stunning and mesmerizing views of Himalayas and lakes from the resort are amazing. The property offers free WiFi and free parking facility. Each room is well equipped and furnished and have a balcony to view the mesmerizing sceneries. Rooms have a TV with satellite channels, air conditioning facility, electric kettle, and minibar. The property also has a restaurant with dining menu, buffet style restaurant, special duet menu on request and kid’s meal. BBQ facility is also available at the Rupakot Resort. 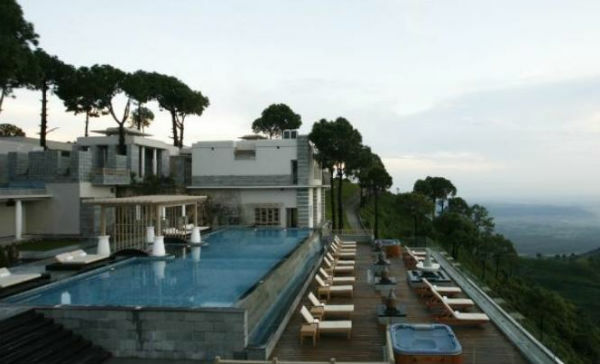 The property has an outdoor pool with the view of the Himalayas. They also offer facilities like sauna, spa, hiking as a recreational activity on the property. Swimming pool, kid’s pool, and meeting or banquet facility is also available at the property. Rupakot Resort also provides airport shuttle service, ticket service, concierge service, air conditioning, non-smoking rooms and designated smoking area. Daily housekeeping, dry cleaning and laundry service is also provided in the property. Situated on the southern bank of Begnas Lake, Begnas Lake Resort and Villas features an outdoor pool, free WiFi and green environment. 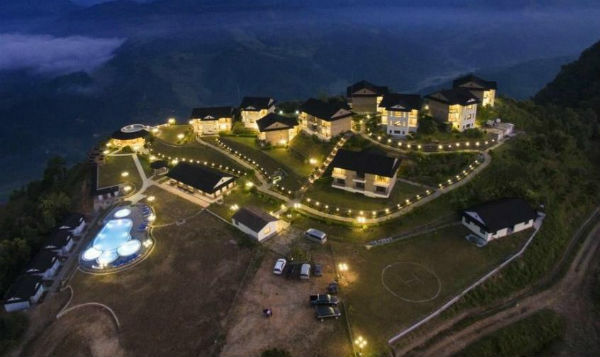 It is nestled away in the forest and 13 Km away from Pokhara Airport. They offer ayurvedic spa, yoga, and meditation facility and free parking facility. The rooms are designed and decorated in ethnic Gurung style which is fan cooled and with telephone, TV and satellite channels. For dining and drinks, the in-house restaurant and bars are also available in the property. Saili – Maili and Kudo are in-house bars which serve different international brand beers, liquors and wines. The in-house restaurant, Jimri, serves various cuisines; local, Tibetan, Indian, Chinese and Continental. Breakfast is delivered in the room and special diet menus are also available on request. For business purpose meeting or banquet facility is also available in the Begnas Lake Resort and Villas. The property also has VIP room facility, nonsmoking room, family room and honeymoon suite. They also offer various services like airport shuttle, babysitting or child care service, ticket, and tour desk, currency exchange, wake up service, laundry, and dry cleaning. Jurassic Resort and Villas has located 4.4 Km away from Fewa lake. The property offers free WiFi throughout the property and free parking is available on reservation. Rooms have a TV with satellite channels, telephone, sofa, and bathroom and tea/coffee maker. Jurassic Resort and Villas offers free airport transfer service. For dining restaurant and bar are also available on the property. They also serve special diet meals upon request. Meeting or Banquet facility, business center, VIP room, family room and honeymoon suites are also available on the property. All the rooms are soundproof and non-smoking rooms. Air-conditioning and heating facilities are available in the rooms. The property features a private pool and BBQ facility. Various other services and facilities are also provided by the Jurassic Resort and Villas like lockers and safe, concierge service, currency exchange, tour desk and ticket service. They also provide car rental service, wake-up service, books, DVDs or music for children, board games, dry cleaning and laundry services. Located 1.6 km away from Pokhara Airport, Shangri-La Village Pokhara is situated beneath the magnificent views of snow peaks of Mountains. The property offers free Wi-Fi and free parking on a reservation. All the rooms are well decorated and equipped with TV, telephone, electric kettle, sofa and bathroom with showers. For dining, option Guest can choose from 2 restaurants available on the property. Caravanserai restaurant serves international dishes whereas The Spice Route serves Eastern dishes. After dining guest can have drinks and cocktails in Trails End Bar. 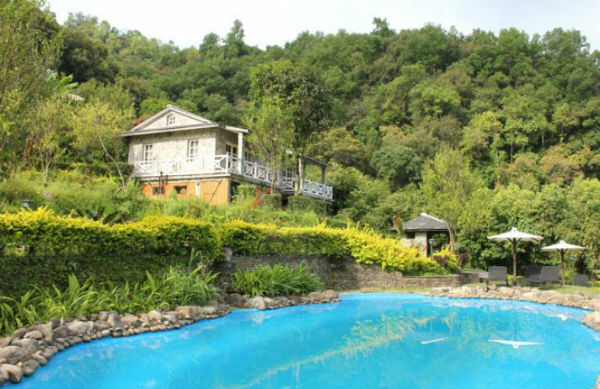 Guest can enjoy the horse riding, pool table, outdoor swimming pool, hiking off the site. For car rental, ticket service, day trips, and tours guest can use hotel’s tour desk service. VIP room facilities, business center, and banquet or meeting facilities are also available in the property. All the rooms have air-conditioning and heating facility and are nonsmoking and soundproof rooms. Shangri – La Village Pokhara also offers various services like airport shuttle, beauty salon, babysitting or child care service, currency exchange, shops, daily housekeeping, laundry and dry cleaning services. Hotel Barahi is located in the heart of Pokhara beside the Fewa Lake which is just 400m away. They feature an outdoor swimming pool and rooms with telephone, flat screen TV with satellite channels and Wi-Fi access in all areas of the property. Free parking is also available on the property. The property has a buffet style restaurant for various dining option and a bar for drinks. They also offer special diet meal on request. Hotel Barahi has an outdoor fireplace, swimming pool, and BBQ facility. The 24 hour Front desk services offered by Hotel Barahi include lockers, ATM on-site, concierge service, currency exchange and a tour desk. For business tours, they also offer banquet or meeting facilities and business center. The other services offered by Hotel Barahi are airport shuttle, shops, wake up service, car rental, and gift shop. It also offers babysitting or child care service, designated smoking rooms, non-smoking rooms, beauty salon, air conditioning and laundry service. 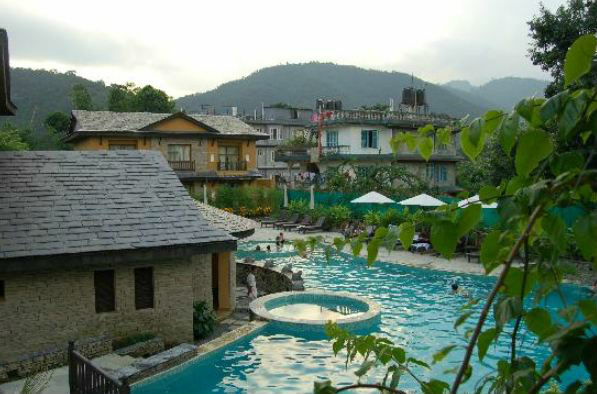 The Temple Tree Resort and Spa is located in Gaurighat, Lakeside 6, Pokhara which is just 800m from Fewa Lake. It features the traditional Western Himalayan architecture in a modern blend. 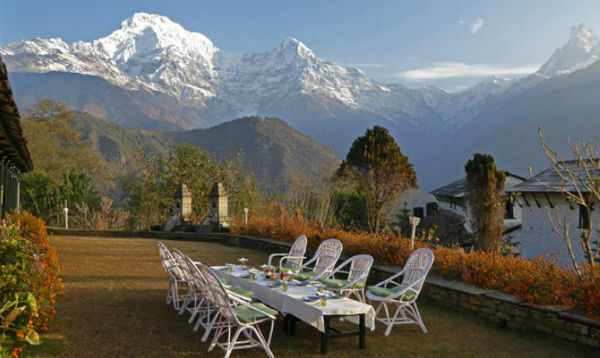 The view from the Temple Tree Resort of Annapurna Mountain Range is really mesmerizing. Temple Tree Resort and Spa is well facilitated with free Wi-Fi in all areas of the property. Also, the free private parking is available on the site. Rooms are well furnished and equipped with flat TV with satellite channels, telephone, electric kettle, bathrooms and a mini bar. The restaurant on the property offers various menus and dishes. It also provides a special diet menu in a request. There is also a bar available in the resort where guest can enjoy different drinks. The resort also has an outdoor fireplace and BBQ facility. It offers the services of currency exchange, airport pickup and dropoff and babysitting/childcare service. Guest can have recreational activities of the site like horse riding, hiking, and cycling. Temple Tree Resort and Spa also facilitates guest with spa, sauna, massage, business centers, banquet, gift shops, airport shuttle, outdoor pool, swimming pool and kid’s pool. The resort has shops on site, ATM, soundproof rooms, heating and air-conditioning facilities, non-smoking rooms and safe. It’s very helpful for me. Thanks for the information.